Horse trainers, also called equine trainers, work with horses to prepare them for riders, races, trail work and horse shows. They help horses adapt to wearing saddles and bridles, teach vital riding commands and work with the animals to correct behavioural issues related to abuse or other trauma. acclimating horses to walking onto horse trailers to get them used to being relocated. Explain what your work entails The main aim is to train horses to win races on the track. This involves working the horses according to their various fitness levels. It also involves making sure the horses stay sound and do not incur injuries. Each horse has an owner/owners who have to be kept informed as to how their horse is progressing, any problems that occur and when he/she will be racing. As I have approximately 120 horses in training at any given time, this involves a fair amount of work! What training did you undergo? It was (and still is) more a case of learning, and gaining experience, on the job. When my father and stepmother started training, I rode every day and learned a great deal. However, it is difficult working for one’s parents, so I moved to SA. 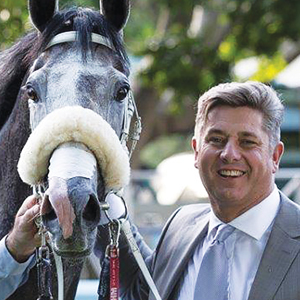 I first worked for trainer Michael Roberts at Turffontein before moving to Port Elizabeth and working for Vaughan Marshall. When Vaughan set up a satellite yard in Cape Town, I grabbed the opportunity with both hands. Describe a typical day I’m at work by 5.30/6am, weekends included. We check whether all the horses have eaten supper and if not, why not, and on any problems. Then the horses pull out onto the tracks in three strings, the first being at 6am. These are usually the horses who are racing soon and need the fast work and the good track surfaces. Between working the strings there is paperwork to be done, owners often visit and want to see their horses, and the vet arrives at some point to check on the lame, sick and lazy. Horses that are racing fit have to be entered in the races – usually about ten days beforehand. Once all the morning work is complete, the horses are fed. We start again at 2pm, when we take the horses for a long walk. Wednesdays and Saturdays are busy race days. What do you enjoy most? One puts in months of work and careful planning, aiming a horse at a specific race and making sure that on the day it is 100%. When the horse wins, it is as if everything has come together. The feeling is incredible; probably the reason I’m still training! Are there aspects of your work that you don’t like? I get extremely frustrated when we (on the training side) have done everything right and the horse is ready to win, but in the race itself things don’t go as planned through jockey error. The jockey gets off and apologises, but the horse has to wait a good few weeks before it can race again and have a chance of earning. To miss an opportunity through incompetence or poor judgement does not sit well. Have there been hurdles you’ve had to overcome? Our daily running expenses have increased enormously over the past couple of years. It is not always possible to carry these increases over into the training fees, which results in the stable having to carry the costs. Is there a type of personality best suited to this work? One definitely needs patience, something which I do not possess in abundance. I am also my own worst critic and if things don’t work out as planned, as often happens, I beat myself up for ages afterwards. One needs to be able to trust one’s staff, as it is impossible to do everything. Any advice for aspiring young trainers? Be prepared to work extremely hard and listen to the guys who have lots of experience. Never be afraid to ask questions. Work in the stables where you will gain hands-on experience; that is the best way to learn. Working in stables and as horse groomers is a way many horse trainers begin their careers. Proficient riding abilities and knowledge of horse husbandry is often mandatory. Some horse training positions have weight requirements. Some horse trainers work as apprentices, performing duties such as stable chores, exercising horses, and feeding and grooming horses. Completing an equine studies programme is another way horse trainers learn required skills. Courses may include horsemanship, equine anatomy and physiology, facility management, equine behaviour, animal ethics and welfare, equine nutrition, and equine diseases.